The wait is OVER – Stuck is HERE!!! The wait is OVER – Stuck (Stitch Trilogy, Book 3) is finally here!!! You can grab your copy NOW – $3.99 ebook, $9.99 print – available at Amazon (print & Kindle), Barnes & Noble (Nook), iTunes, Kobo, and wherever else ebooks are sold! I *can’t wait* to hear what you all think about the conclusion to Alessa & Isaac’s adventures. As always, it would be a HUGE help if you could tell your friends about the series and post a review on Amazon & Goodreads! Thank you for all your support!! PS – Stuck is on tour through the 22nd! Follow along for reviews, fun guest posts and interviews, excerpts, and of course, a big giveaway! Stitch Trilogy fans, the countdown has begun!! Release day for Stuck (Stitch Trilogy, Book 3) is only a few short days away on Saturday, December 15th (sign up here for a reminder once it’s available!) and TODAY we are launching the Stuck Blog Tour & Bookstagram! The full tour schedule will run from now through December 22nd, with TWO big giveaways with lots of prizes, and tons of interviews, guest posts, sneak peek excerpts, and more! Keep up with the tour by checking back here regularly, or by following the Samantha Durante or Stitch Trilogy’s Facebook pages, @SamanthaDurante on Twitter, or @AuthorSamanthaDurante on Instagram. And don’t miss these highlights from today’s stops! Prizes include signed print copies of the entire trilogy, a limited-edition Stitch scarf, ebook copies for you and a friend, bookmarks, and Amazon gift cards galore! Open internationally, one (1) first prize winner and three (3) second place winners. Enter at the links above! Check out the Guest Post “A Tale of Three Book Covers” over at Andi’s Young Adult Books! Huge thanks to Prism Tours and all the bloggers/instagrammers signed up for the tour! So excited to hear what you all have to say about the book!! So excited to finally share the cover for Stuck (Stitch Trilogy, Book 3)! I had this cover designed wayyy back in 2016 and have been (very impatiently) sitting on it ever since. You may have caught a sneak preview in the back of Shudder if you have a recently purchased/updated e-book copy, but besides that, I’ve mostly been waiting until closer to the book’s release (scheduled for December 15th!!) to share. So, without further ado, here it is! Hope you guys love it as much as I do! And, of course, to celebrate we’re doing a giveaway!! 2 New Arrivals: Mia and… STUCK!!! Dear Stitch Fans, I am over-the-moon to announce not one, but two brand-spanking-new arrivals! First, I’d like to introduce you to the newest member of our family, Mia! Baby Mia joined us earlier this summer and has filled all our hearts to bursting, especially big brothers Kiran & Gio (the cat). She is the sweetest little nugget we could ever have hoped for, and – as the meaning of her name (“wished for”) attests – she has given us the priceless gift of another opportunity to raise a daughter, something we wondered if we had lost forever after her older sister, Alana, was stillborn in 2013 (shortly after I published Book 2 in the series, Shudder). I hope you guys are excited about these announcements as I am! Thank you for all your support, and stay tuned for more updates soon!! 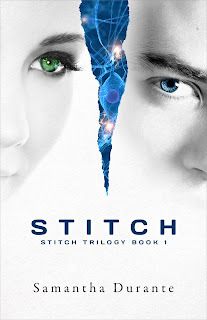 PS – If you missed the sneak preview excerpt from Stuck on my previous post, head over there to whet your appetite for the final book of the Stitch Trilogy! Oh, hey there. Not much new around here, just a few super boring announcements I wanted to share. Nothing exciting, so don’t go getting your knickers in a bunch. 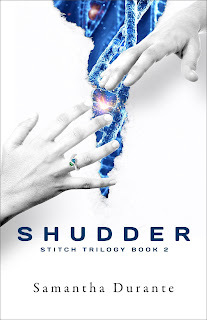 I’ve got a new cover for Stuck (Stitch Trilogy, Book 3) – if you own an e-book copy of Shudder and can update it to the latest version (most readers can do that at www.amazon.com/mycd), you can find a sneak peek right before the Epilogue. If you can’t see the new cover in your copy, no worries – I’m planning to do an official Cover Reveal soon. Any book bloggers out there want to help me? Oh yeah, almost forgot: Stuck is ~65% done, and I have plans to finish the first draft in the next 24 days. No big deal. Isaac reclined back on the shore absentmindedly digging his fingers through the grass, enjoying the scent of fresh pine needles, the unseasonably warm spring sun stroking his face, and – especially – the view. Alessa stood with her back to him, her tall, curvaceous form poised on the edge of a large boulder, the afternoon sun reflecting off the water of the lake onto her long, bare limbs, her skin glowing luminous against the forest. Isaac groaned hungrily to himself, and she paused to toss one coy, teasing glance over her shoulder at him before leaping off and slipping into the water. Surfacing with a yelp, she swam hastily towards the shore, visibly shivering under the gentle waves. Her teeth chattering, she waded in the neck-deep water until she could find her footing. “It’ll be April n-n-n-next week,” she argued, hissing through clenched lips. “And April is swimming weather since when exactly?” Isaac laughed and shook his head. “Come here and let me warm you up.” He narrowed his sapphire eyes at her enticingly. Alessa grinned. She worked her way towards him, the water slinking over her limbs as her smooth, porcelain skin broke the surface with each stroke. Isaac’s stomach clenched with desire. Dipping her face under, she came up standing and tossed her dripping hair back. The lake now at her shoulders, she treaded slowly forward, Isaac’s heart rollicking in anticipation as the water inched down, down, down over her chest. And then, just before it reached the promised land, she went rigid, her features twisted in concern. Guys, guys… in case you fell for my Jedi mind trick (did you? did you?? ), to be clear, I am SUPER EXCITED about all of the above!!! I’ve been trying to play it cool, but man, cool is NOT my thing, you know? Ahhhh!!! Stuck is almost done! I’m planning to release it later this year!! THE WAIT IS ALMOST OVER! Official release date will come with the Cover Reveal in a couple months – I don’t want to commit to anything yet until I’m 100% sure I can deliver, and, oh, I’m expecting a baby in a few weeks (another girl!!! Kiran is SO excited to be a big brother! ), so yeah things are a little hectic around here – but IT’S REALLY HAPPENING. Consider my knickers bunched! Hope yours are too!!! In all seriousness, I know it’s been a long wait; thank you for sticking with me through thick and thin. I can’t tell you how much all of your support means to me, and I absolutely can’t wait to share Book 3 with you! GIVEAWAY: Signed ARC & Limited Edition Stitch Scarf! To celebrate the release of the Stitch 2016 Revised Edition, I’m giving away three (3) awesome prize packs, each including a signed ARC and a limited edition Stitch scarf!!! These ARCs and scarves are some of only five in existence (the rest of which I’m hoarding for my own personal enjoyment), so I’m SUPER excited to be sharing these with fans of the trilogy! The super-soft, cozy scarves were created by the one and only Litographs and feature the exact text from the revised edition of the book! SO COOL. (In case you were wondering, yes, I will be sporting mine all winter long!) They also have tons of other awesome products if you’re looking for gift ideas for the literature lover in your life (or yourself, haha) – t-shirts, totes, posters, etc. – featuring your favorite classics (Pride and Prejudice, The Great Gatsby, Shakespeare), contemporary hits (Outlander, Cinder, The Time Traveler’s Wife), and more! (Note: this is NOT a sponsored post, I’m just an unabashed fangirl! Lol). In short, lots of goodness in this giveaway, so don’t miss out!! Enter to win below – it’s totally free, open internationally, and will run until December 12th! SURPRISE!!! Revised Edition of Stitch Available TODAY! Ok Stitch fans, I have a big announcement that I’m very excited to share… I recently invested a little (a lot of) time in creating a *new and improved* revised edition of Stitch and it’s available… today!! “Wha-wha-whhaatt…” did you say? I know, you must have questions, considering I totally snuck this project up on you. So I went ahead and made a little FAQ that will hopefully clarify everything – read on! Wait a sec… aren’t you supposed to be writing Stuck?? Why, yes. Yes I am. But the thing is, when I release Stuck, I obviously plan to do a huge promotional push to hopefully draw more readers into the series. And to be frank, the thought of potentially thousands of new readers reading Stitch as it was – and forming their first impressions of me as a writer based on the original version of the book – was making me cringe. And that icky, knotted-stomach feeling was pervading my enthusiasm for Stuck and for the series as a whole. So in order to give this trilogy its rightful end, I felt I needed to go back to the beginning and make sure that Book 1 was done to the very best of my ability. As much affection as I have for the original version of Stitch with all its quirks and flaws, I’ve learned a lot since it was published and have grown a lot as a writer (much of which is thanks to you and all your wonderful – sometimes brutally honest! – feedback, dear readers. I told you I read all the reviews, didn’t I?? ), and I want the series opener to be the best it can be. Make sense? Ok, awesome. So what’s new? Let’s start with what’s NOT new. First off, the plot. Nothing about the storyline, or the characters’ history, or the major plot points have changed. So if you don’t feel like re-reading it before Stuck releases, that’s no problem at all – you won’t be missing any essential information for the finale and can jump right in when Stuck comes out. What HAS changed is the storytelling. It’s faster-paced, more intense, more engaging. Mostly, there’s less exposition – there’s more showing and less telling, i.e. through flashbacks, conversations between characters, hints in the setting, etc. So that means… new scenes! You’ll find LOTS of new interactions between Isaac, Alessa, Janie and the rest of the crew, more of Isaac’s POV, more action, more ROMANCE… and a *bit* less of Alessa blathering on in her head about her feelings or describing inconsequential details of her everyday life (the number one critiques of the original version of the book, which I have to wholeheartedly agree with). I want it!! How do I know what version I have? Check out the copyright page (two pages after the cover). If it says “Copyright © 2012 Samantha Durante” it’s the original. If it says “Second Edition, Revised 2016. Copyright © 2012, 2016 Samantha Durante” you’ve got the revised version! Argh, I’ve still got the old one – how do I get my revised edition?? If you bought a paperback copy: All paperback copies have been sold through Amazon, and Amazon has a great feature where I can make a discounted Kindle version available to owners of the print version. So guess what – I made it free!! Just log in to your account on Amazon.com, go here, and download your free updated Kindle copy. If you bought an e-book from B&N, iTunes, Kobo, Smashwords, or elsewhere: Stitch is exclusive to Amazon for the next few months (more on that in an upcoming post), so you won’t be able to get the update until around March-ish (sorry!). And to be totally honest, I’m not really sure how updates work at these other vendors… Worst case, if you can’t get the update from wherever you bought it (or just don’t feel like waiting), just email me and I’ll send you a copy! Ok, I’m re-reading Stitch… Now what’s up with Stuck??? FINALLY – I’m writing it! For reals!! Sneak peek coming soon! And I’ve even got some super sweet revised cover art… More on the cover reveal coming as soon as I feel confident enough to announce an official release date, hopefully in the next few months! As always, thank you again readers for all of your support and enthusiasm, for giving me the confidence to keep writing, the courage to make hard choices, and the chutzpah to admit when I haven’t done my best. I’m really proud of the new and improved Stitch, and I hope you love it too! PS – Celebratory GIVEAWAY coming soon with some really awesome prizes!!! Check back here in the next couple days for details, or sign up on the mailing list here to get a notification (I only send 1-4 emails a year tops, promise). Quick Announcement – I’m BAACCKKK! No release dates or anything just yet (I’m still trying to figure out how to get back in the productivity groove now that I have a toddler running around here!! ), but I just wanted you all to know that it is REALLY happening. And it feels so good. In the meantime, hope you’re all doing well and looking forward to getting back in touch once I can leave my writing cave!! Today I’m thrilled to introduce you to my beautiful baby boy, Kiran! Kiran (pronounced just like the more common Irish name Kieran) is a Hindi word that means “beam of sunlight” or “first rays of dawn” – a fitting description of what this child means to us and our family. Until then, I will be basking in the bliss of this tiny little person who has brought so much joy and love to my life (…and trying to catch up on some sleep!). Readers, family, and friends – thank you again for all of your support through this incredibly difficult past year. I feel very blessed to be surrounded by so many caring people. Thank you for everything. You may remember a few weeks back I posted about The Hunt for Tomorrow, a virtual scavenger hunt with amazing prizes, including the chance to name/theme a progressive story written collectively by 20 authors sponsoring The Hunt. Well, ladies and gents, that story is here! The novella-length story is called “The Catastrophe Theory” and it stars scientist Eve, prepper Jared, and their very unique daughter Cassie in a post-apocalyptic techno-disaster. The story has been evolving spontaneously as each author takes their turn writing the next chapter each day and adding his/her own twists to the plot, and it’s been quite a suspenseful ride! A new chapter has been published every day for the past couple weeks, and yesterday, it was my turn! So without further ado, check out Chapter 13 of The Catastrophe Theory – and if you haven’t read the first 12 chapters, start here!! Follow along on The Hunt blog or Facebook page to read the remaining chapters as they’re published each day! Still got about a third of the book to go… can’t wait to see what happens!! Stuck Music Playlist, Excerpt, Author Interview & More! Stitch is currently available to borrow for FREE from the Kindle Owners' Lending Library! Like the Stitch Facebook page and sign up on the Contact page for notification about Shudder, the sequel to Stitch! Sign Up to Review Stitch! Calling all bloggers! If you're interested in reviewing Stitch, please sign-up here to let us know. We'll help you promote your post!